Summer is the best time not only to master new means of sports but also challenge own health and take some serious risk. This means, you can venture to try even such an uneasy game as American football. Before taking a deep plunge into thrilling adrenaline rush, OUTLOOK brings to your notice some theory and interesting facts about the New World’s main hobby. According to official “legend”, American football springs from British rugby that accidentally emerged in 1823. The word is that during one of football games in the city of Rugby a boy called William Webb Ellis grabbed the ball with his hands for some reason and ran across the whole ground, virtuously getting away from every player who attempted to take the tool from him and get back to competition. Both sportsmen and audience got so impressed with this run that in merely several years the British were playing with both arms and legs. And it was them who brought the game to the United States where the first official match is believed to be the one of 1869 between Princeton and Rudgers Universities. American football has always been not only spectacular but also very high-injury. On top of that, statistics of deaths in this sport is horrifying therefore they even attempted to forbid it in 20th century; even Presidents of the United States interfered with the case. But people managed asserting favorite amusement. Nevertheless, it was after Roosevelt had put his finger into it in 1939, when it became forbidden to hold games without sportsmen wearing protective uniforms. Unfortunately, till now it is American football that accounts for 46% of deaths in all kinds of sport. Due to high intensity and constant injuries, over fifty players can sit on the bench, ready to enter the game any minute. On the field itself 11 players in each team compete. A game’s “pure” time constitutes 60 minutes. But because of technical shifts and substitutions matches extend for 2-3 hours. To say that in the USA American football is Sport #1 is to say nothing. About one third of the population, according to social studies, consider themselves to be fans of the game. Remaining two hundred million people have nothing else to do but to watch competitions to join the crowd. Exceptional hype is caused by Super Bowl – the final in which two best teams of own conferences meet. In 1985 this enormous event coincided with inauguration of Ronald Reagan. Surprising as it may sound it was the White House that had to shift the date. Till 1970 two leagues functioned in the country. When they conciliated their differences to unite into a single one, a joke was popular in America that this event could have been compared to hypothetical merger of Catholic and Orthodox churches. In 1990s several independent companies decided to undertake a study of Americans-buying-food issue. It turned out that before Super Bowl supermarkets are emptied almost as much as before Thanksgiving. To sing the anthem before the final or entertain audience during a break is a dream of as nearly as every Western musician. In their due time such an honor was granted to these legendary performers: U2, Sting, Paul McCartney, The Rolling Stones, Prince, Bruce Springsteen, The Who and The Black Eyed Peas. National Football League is the world’s wealthiest sports organization. The lion’s share of its revenues comes from selling commercial time during the final and play-off games. In late stages of the championship in order to demonstrate a 30-second-long commercial video, willing ones lay out from 3 to 4 million dollars. Important thing is that political campaigning is forbidden – no matter how much money is offered. Words NFL, Super Bowl and Super Sunday are registered trade marks therefore they can only be used upon coordination with the Federation – that also adds millions to its accounts. On Sunday, September 17th, symbolically at 20.17 local time, the 5th Asian Indoor and Martial Arts Games solemnly opened in the capital of Turkmenistan. It is the sports competition held every four years under the auspices of the Olympic Council of Asia and under the supervision of the International Olympic Committee. The team of the Ukrainian Internet magazine about the world OUTLOOK publishes its first highlights on this pan-continental sport event. We continue our special section dedicated to 2017 Ashgabat Asian Indoor & Martial Arts Games that start in mid-September in Ashgabat. Right now, when the tournament is about to start, the main city of Turkmenistan in round-the-clock mode is preparing for competitions and arrival of thousands of guests from all over the world. “To drag a goat with one’s hands” is a national entertainment of Tajik men however it enjoys huge popularity around Central Asia in the whole. As a rule a couple dozens, sometimes as many as a hundred, skilled and nimble horse riders gather to drag the goat. There is such a throng during the event that people fall off their horses, lose consciousness and even get maimed. 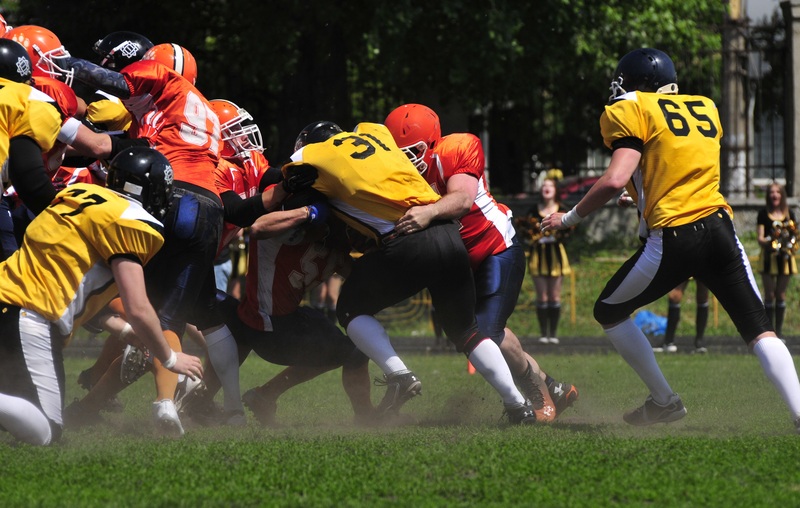 Although the players attempt at protecting their legs and heads, hurts and bruises are commonplace for them anyway.